Objectives: Parkinson’s disease (PD) has been associated with impaired motor sequence learning (also known as procedural learning). In the current study, we determined the potential of anodal transcranial direct current stimulation delivered over the primary motor cortex to promote the acquisition of sequential movement in a large sample of patients with idiopathic PD and matched controls. Methods: Thirty-one idiopathic PD patients and 33 healthy controls, matched for age, gender, and education, participated in the study. Both groups received anodal and sham transcranial direct current stimulation delivered over the primary motor cortex during the acquisition of a novel sequence movement in the Serial Reaction Time task. Results: Motor sequence learning proved to be intact in patients relative to controls. Compared to sham stimulation, anodal transcranial direct current stimulation of the primary motor cortex did not significantly improve motor sequence learning in patients, nor controls. Conclusions: Anodal transcranial direct current stimulation delivered over the primary motor cortex did not exert a positive effect on the acquisition of sequential movement in patients with Parkinson’s disease. More research is needed to establish the determinants associated with a positive effect of tDCS on sequential skill in PD, such as medication status, the amount of tDCS stimulation needed, as well as the brain regions that need to be targeted to elicit a beneficial response. Parkinson’s disease (PD) is a progressive neurodegenerative disorder characterized by bradykinesia, postural instability, rigidity, and tremor . Primary symptoms originate from the loss of dopaminergic cells in the substantia nigra pars compacta. While originally considered a movement disorder, it is now recognized that cognitive impairment is widespread among PD patients. Mild cognitive impairment is present in the majority of PD patients from the initial stages of the disease, and 20% to 40% progress to Parkinson’s disease dementia . Cognitive impairments in the planning, programming, and execution of movement directly contribute to the motor losses typically observed in PD. The association between cognitive and motor impairment in PD is explained by the disrupted activity of a series of highly interconnected neural networks, the corticobasal ganglia–thalamocortical loops that regulate motor control, cognition and emotion . In the current study, we investigate one particular type of cognitive function that is known to be directly related to motor function: motor sequence learning, also known as procedural learning or learning of sequential movement . Normal daily activities, such as walking, cooking, driving a car, playing sports, all require the knowledge to properly initiate, regulate and execute the correct order of successive movements in time. Acquisition of this type of sequential motor knowledge has been shown to be significantly attenuated in PD [5-10], albeit not consistently . Learning of sequential movement relies on a distributed network including the primary motor cortex, basal ganglia and the cerebellum [11,12]. However, fMRI research has indicated that, compared to healthy controls, patients with PD need to recruit additional brain regions (e.g. premotor area, parietal cortex, precuneus and prefrontal cortex) to perform sequential behavior, making overall motor control cognitively more demanding . As can be predicted from cortico-basal ganglia–thalamocortical networks regulating both cognitive and motor function, PD patients’ cognitive status has been demonstrated to be directly associated with their ability to acquire sequential movement [5,6,9]. At present, motor impairment in PD patients in clinical settings is primarily targeted by means of motor rehabilitation programs. For instance, so-called ‘cueing methods’ are applied to train motor skill by imposing cue-induced movement guidelines: through the use of external cues (visual or auditory), a complex motor action (e.g. a sequential movement such as getting out of bed) is fragmented into explicitly stated manageable units . A serious challenge for traditional rehabilitation programs in PD, however, is the observation that motor function remains compromised in PD patients even after extended training . Alternative methods are therefore needed to support motor function. In the current study, we determined the potential of transcranial direct current stimulation (tDCS) to enhance sequencing skill in PD patients . tDCS is a non-invasive neuromodulation technique that refers to the application of a weak direct electric current on the skull . Although the exact mechanism underlying tDCS remains to be fully explained, it is suggested that it modulates brain excitability at cortical and subcortical levels by shifting the resting potential of neurons. Anodal tDCS of the brain generally leads to an increased excitability, whereas cathodal tDCS leads to a decreased excitability. Promising effects in PD patients on a variety of motor symptoms (e.g. gait, upper extremity bradykinesia, simple reaction time, UDRS-score, freezing of gait) [17-20] and cognitive functions (working memory, executive function) [21-22] have been reported. This suggests that tDCS is able to modify the abnormal activity of corticobasal ganglia-thalamocortical networks in PD. In the current paper, we applied anodal tDCS to the primary motor cortex of PD patients and matched controls to stimulate learning of a novel sequential movement in the Serial Reaction Time (SRT) task [4,23]. The SRT task is a commonly used research tool to determine motor sequence learning, and establishes the acquisition of an unfamiliar movement sequence in a learningby- doing fashion. In a prototypical SRT task, participants are instructed to respond as quickly and as accurately as possible to a stimulus presented in one of four locations on a computer screen by pressing a spatially compatible response key (Figure 1). 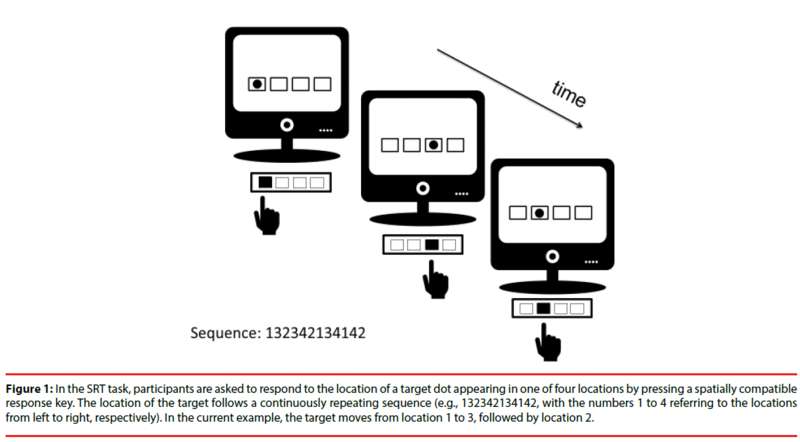 Figure 1: In the SRT task, participants are asked to respond to the location of a target dot appearing in one of four locations by pressing a spatially compatible response key. The location of the target follows a continuously repeating sequence (e.g., 132342134142, with the numbers 1 to 4 referring to the locations from left to right, respectively). In the current example, the target moves from location 1 to 3, followed by location 2. Participants are not informed that the location of the stimulus follows a continuously repeating sequence (for example 132342134142, with the numbers 1 to 4 referring to the leftmost, left, right and rightmost target location; after the final target element of the sequence is presented, the sequence is repeated). Typical results are that (1) reaction times (RTs) decrease as training progresses, which is called the general training effect and (2) increase when the sequence is interrupted by a random sequence, followed by a decrease upon reinstallation of the initial sequence, referred to as the sequencespecific learning effect. The general training effect provides general performance-related information (e.g. general motor performance, effects of task routine, preliminary indication for sequence learning). The sequence-specific learning effect is considered the primary outcome measure of sequence learning in the SRT task, as it specifically reflects the acquired knowledge of the sequence. Both effects are reported irrespective of participants’ awareness of the sequence that might emerge over the course of the experiment. In the current paper, we determined whether motor sequence learning in the SRT task in PD could be enhanced by anodal tDCS delivered over the primary motor cortex. In young adult healthy individuals, anodal tDCS has been shown to induce positive effects on motor sequence learning in the SRT task. In one study, the beneficial effect on motor sequence learning resulted from anodal cerebellar stimulation , whereas in two other studies it was achieved by means of anodal stimulation of the primary motor cortex [25,26]. In contrast to young healthy individuals, a positive effect of tDCS on motor sequence learning in PD patients remains to be determined. We are aware of one tDCS study in PD patients on motor sequence learning using the SRT task . However, the authors were unable to observe an enhancing effect of anodal tDCS delivered over the premotor and motor or prefrontal cortices, when they compared 12 PD patients receiving sham with 13 PD patients receiving tDCS stimulation (no control group was included). Possibly, the between-subjects variability arising from the between-subjects delivery of stimulation might have obscured a positive effect of tDCS on motor sequence learning in PD. In the current study, we therefore used a within-subjects comparison of sham and tDCS stimulation in a large sample of PD patient to investigate whether motor sequence learning could be promoted by anodal tDCS delivered over the primary cortex. In addition, a between-subjects comparison with matched controls was included to determine the size of a possible tDCS effect on sequential skill in PD in comparison with controls. The following research hypotheses are put forward. Because previous research has reported beneficial effects of tDCS on some aspects of motor function in PD patients [17-20] but not on motor sequence learning, the effect of tDCS stimulation on sequence learning in PD remains to be established . Hence, no specific predictions regarding the difference in sequence learning between sham and anodal stimulation conditions is put forward for the group of patients. We do expect controls, however, to benefit from anodal tDCS stimulation of the primary motor cortex as compared to sham stimulation, as has been observed systematically in previous sequence learning studies in young adults [24- 26]. Secondly, impaired sequence learning in PD patients is frequently reported [5-10], although not systematically . We therefore expect patients to show disrupted sequence-specific learning as compared to controls, in addition to a general motor impairment. Thirty-three idiopathic PD patients and 33 healthy controls, matched for gender, age and education, participated in the study. Demographical data of both groups are listed in Table 1. *difference significant at 0.05 level, ** difference significant at 0.01 level, *** difference significant at 0.001 level Note. M, mean; SD, standard deviation; NA, not applicable; Education was defined on a 4 level ordinal scale (1=elementary school, 2=lower secondary school, 3=higher secondary school, 4=higher education); H&Y, Hoehn and Yahr rating scale; UPDRS – III, Unified Parkinson’s Disease Rating Scale; MMSE, Mini-mental state examination; SCOPA-COG, SCOPA-COG: SCales for Outcomes in PArkinson’s disease – COGnition; HADS, hospital anxiety depression scales; D, dopamine. Table 1: Demograhical, clinical, and neuropsychological measurements of PD patients (PD) and healthy controls. PD patients had to meet the following criteria in order to participate: (1) idiopathic form of PD, (2) Hoehn & Yahr stage II or III, (3) no neurocognitive disorder (Mini-Mental State Examination score>24/30), (4) no deep brain stimulator (contra-indication tDCS), (5) no additional neurological disorder, (5) no epilepsy (contra-indication tDCS) and (6) no skin condition (contra-indication tDCS). Healthy participants were excluded if they (1) suffered from any neurological disorder, (2) had epilepsy, (3) took drugs that affect cognition or (4) had a skin condition. The study took place in participants’ home environment in a quiet and slightly dimmed room under the supervision of the examiner. Testing occurred at home instead of at the laboratory for the patients’ convenience and comfort. Each participant was tested twice per week over the course of two consecutive weeks (see also SRT task description below). Week 1 started with Testing day 1 (e.g. Monday), followed by Testing day 2 (e.g. Wednesday) two days later in order to prevent carryover effects. In Week 2, Testing day 3 (e.g. Monday) and Testing day 4 (e.g. Wednesday) started exactly one week after Testing day 1 and 2, respectively. Each of the four testing days consisted of one clinical test and one SRT task on computer. One testing day lasted maximum 1 hour (approximate duration between 45 and 60 minutes, depending on the type of clinical test administrated, see below). The supervisor carefully monitored signs of fatigue in participants, informing them that they could take as many breaks as needed. All testing took place in the on-phase of antiparkinsonian medication, between 60 to 90 minutes after patients took their morning dose. We opted to test in the onphase so that patients could perform the SRT task on computer with minimal motor complaints and to be comparable with a previous tDCS study on sequential skill that tested PD patients while being on medication . All patients confirmed that the medication satisfactorily relieved their symptoms prior to the start of the experiment. Participation in the experiment was voluntarily with informed consent according to the Declaration of Helsinki. The study was approved by the Ethics Committee of the Vrije Universiteit Brussel (VUB). Previous studies have shown that patient variables such as cognitive and motor status can have a significant impact on the amount of sequence learning in PD [5,6,9]. To determine the effect of these patient variables in the current study, all patients and controls underwent a neuropsychological and motor assessment. The Mini-Mental State Examination (MMSE)  was used as a general screening instrument for intellectual functioning. The scales for outcomes in Parkinson’s disease-cognition (SCOPA-COG)  was administered to assess the following cognitive functions: (1) memory and learning, (2) attention, (3) executive functions, and (4) visuospatial functions. Part III of the unified Parkinson disease rating scale (UPDRS)  was used to evaluate motor function. We also assessed a possible role of affective complaints on reaction time performance in patients by means of the Hospital and Anxiety Depression Scale (HADS) . Scores exceeding the cut-off value of 7 on the HADS subscales reveal elevated levels of affective complaints. The order of clinical test administration (MMSE, SCOPA-COG, UPDRS-III, HADS) was counterbalanced across participants over the course of the four testing days. As mentioned previously, each participant was tested twice a week on two consecutive weeks, in total completing the SRT task four times (Figure 2). Figure 2: Experimental design. Over the course of two consecutive weeks, the SRT task was executed twice (Testing day 1 and 2) under the same stimulation condition (sham or anodal tDCS stimulation, depending on the counterbalancing order) during Week 1 and twice (Testing day 3 and 4) under the same stimulation condition (anodal tDCS or sham stimulation, depending on the counterbalancing order) during Week 2. All experimental blocks of the SRT task contained the repeating sequence (S), except for random Block 7 (R). In Week 1, participants carried out the SRT task on Testing days 1 and 2 under the same stimulation condition (thus either twice under sham or twice under tDCS stimulation, depending on the counterbalancing order of stimulation), followed by two executions of the SRT task one week later in Week 2 on Testing days 3 and 4, under the reversed stimulation condition. Hence, half of the participants executed the SRT task twice under sham stimulation during the first week, and twice under tDCS stimulation the second week. The other half received the reversed order of stimulation. We let participants carry out the SRT task twice per week but with a reduced number of trials in order to counteract fatigue in patients. The SRT task comprised fewer trials in comparison to previous tDCS studies on sequence learning but because it was administrated twice we could assure that the total number of SRT trials was comparable to that of previous studies. The SRT task was conducted on an Intel Core 2 Duo portable computer with 15.6-in. screen. E-Prime software (Psychology Software Tools, Inc., Pittsburgh, PA) was used for data presentation and collection. On each trial of the SRT task, a target dot of 8 mm diameter (or 0.8° visual angle with a viewing distance of 60 cm) appeared in one of four horizontally aligned squares of 1.5 × 1.5 cm (1.4° visual angle), Figure 1. The four squares, from left to right, corresponded to the leftmost, left, right, and rightmost target location. Gaps between squares measured 2.5 cm (2.4° visual angle). Participants were instructed to react as fast and as accurately as possible to the location of the target dot by pressing the spatially compatible response key with the index finger of their dominant hand. Handedness was assessed by means of self-report: two patients and two control participants were left-handed. The spatially compatible response keys X, C, B and N keys of a standard keyboard had to be pressed for a target appearing at the leftmost, left, right, and rightmost target location, respectively. In the standard SRT task, four fingers are used, but because this proved to be too difficult for a number of patients in a pilot study, we opted to solely use the index finger for responding. The target was presented until the response was made. The next target appeared after a response-stimulus interval of 300 ms. In case of an incorrect response, the word “Error” was presented for 750 ms. The SRT task administrated on each of the four testing days always started with one practice block of 12 trials with randomly appearing targets to familiarize participants with the task. Subsequently, the actual experiment started, in which participants executed eight experimental blocks (Blocks 1-8) of 72 trials each. During all experimental blocks, except for random Block 7, a twelve-element sequence (for example 132342134142, with the numbers 1 to 4 referring to the leftmost, left, right and rightmost target location) was imposed on the target’s location and repeated continuously. Eight structurally identical sequences were used across participants to rule out that sequential learning effects were specific to a particular sequence structure. In Block 7, the sequence was replaced by a random sequence to determine sequencespecific learning. To counteract potential carryover effects, the SRT task conducted under tDCS stimulation followed another repeating sequence than the SRT task conducted under sham stimulation. After each block of trials, patients received feedback about their performance in that particular block. The next block started after a break of 30s. During the SRT experiment, participants underwent active anodal tDCS of the primary motor cortex M1 or sham stimulation, administrated in a counterbalanced order over testing weeks. tDCS was delivered to the participants’ scalp using a constantcurrent stimulator (Oasis Pro, Mindalive Inc). Electrodes were placed in saline-soaked sponges. The active anode electrode (size 4.387 cm x 4.387 cm=19.25 cm2) was placed over M1 on C3 or C4, contralaterally to the performing dominant hand, using the international 10-20 electroencephalogram system. The reference cathode electrode was positioned on the forehead on Fp 1 or Fp 2, ipsilaterally to the performing hand (thus contralaterally to the stimulated side). For the anodal stimulation, the tDCS current was ramped up for 60 seconds at 1 mA and then remained on for the remainder of the 20 minutes stimulation period (duration of the SRT task). This resulted in a current density of 0.052 mA/ cm2.To prevent patients to guess whether they were receiving tDCS or sham stimulation, the following precautions were taken for the sham stimulation. First, the current was ramped up for 60 seconds at 1 mA and then slowly tapered down to 0 mA over the following seconds. Then, towards the end of the experiment, the current was again ramped up for 60 seconds at 1 mA and then switched off. Participants’ awareness of which stimulation condition was delivered on a given testing day was not explicitly probed. Because the experimenter was aware which type of stimulation was administrated to each participant, the current study applied a singleblind design. Due to unexpected motor complications, two patients failed to successfully execute all four sessions of the SRT task. The data of these patients were discarded from the analyses, leaving a total sample of 31 patients (of which 15 received anodal stimulation first) and 33 controls (of which 17 started with anodal stimulation). Chi-square tests and independent t-tests were used to analyze demographical and clinical differences between the two groups. The analyses of the SRT task performance was based on the median RTs per block, with the exclusion of practice trials. Median RT was used instead of mean RTs, to minimize potential skewing. Erroneous responses and responses following an error were discarded from the analysis (5.5% of the total data). Error rates were not further analyzed, as accuracy did not statistically differ between the two groups, F(1, 62)=.79, MSE=67, p=.376, ηp 2=.01, and did not reveal any significant pattern of interaction with stimulation condition, all ps>.05. Mixed factorial ANOVA’s were implemented to analyze the median RT data per block (dependent variable). The RT analyses were collapsed across the two SRT tasks within each testing week (and thus also across each stimulation condition) to facilitate interpretation. This did not alter the main findings, nor did stimulation order (anodal or sham stimulation first). We first analyzed a general training effect or a decrease in median RT over the 7 experimental blocks in which a regular sequence was implemented, in a 2 × 2 × 7 ANOVA with Group (PD, controls) as betweensubjects factor, and Stimulation (tCS, sham) and Block (Blocks 1-8, without random Block 7) as within-subjects factors. To determine whether there was a significant reduction of RTs across blocks, we performed a linear trend analysis based on the calculation of polynomial contrasts. Secondly and more important, the primary outcome measure sequence-specific learning was estimated by comparing the RTs in random Block 7 with the average of RTs in the surrounding sequenced Blocks 6-8. Sequencespecific learning effects were analyzed in a 2 × 2 × 2 ANOVA with Group (PD, controls) as between-subjects factor, and Stimulation (tCS, sham) and Sequence (random Block 7, mean of sequenced Blocks 6-8) as within-subjects factors. Post-hoc Tukey tests were implemented to estimate sequence-specific learning effects for each group. To determine whether sequence skill was associated with specific patient variables, we carried out Pearson correlational analyses (Bonferroni-corrected for multiple comparisons) to establish possible correlations between the amount of sequence-specific learning and demographical, neuropsychological and motor variables. All analyses were carried out using Statistica Version 11 and were two-tailed, using a significance level of .05. Table 1 shows the differences in demographical, clinical, and neuropsychological measurements between the two groups. As expected, PD patients showed impaired motor function, as measured by the UPDRS-III. In line with the inclusion criteria, all participants scored above the standard cutoff score of 24 on the MMSE. The patient group, however, did show signs of cognitive impairment as can be inferred from the SCOPA-COG test. Patients obtained a lower global SCOPA-COG score, as well as lower scores on the SCOPA-COG subscales memory and learning and executive functions. Scores exceeding the cutoff value of 7 on the HADS Anxiety subscale suggest that clinically elevated levels of anxiety were reported by the patients, albeit not statistically different from the control group. Patients also reported higher levels of depressive complaints compared to controls, as indicated by the HADS Depression subscale, although their scores did not exceed the cutoff value of 7. General training effect: PD patients were overall slower (sham: M=947 ms, SD=17,4 and stimulation: M=927 ms, SD=27,3) relative to controls (sham: M=667 ms, SD=25,5 and stimulation: M=668 ms, SD=34,6) (Figure 3). Figure 3: Mean median RTs per block and stimulation condition (sham or anodal tDCS delivered to M1) for PD patients (PD) and healthy controls. All blocks are sequenced, except for random Block 7. Sequence-specific learning effects were derived from comparing the reaction times of random Block 7 with the mean of surrounding sequenced Blocks 6 and 8. Vertical bars denote standard errors. This resulted in a significant main effect of Group, F(1, 62)=10.75, MSE=1518216, p<.001, ηp2=.15. Block also yielded a significant main effect, F(6, 372)=20.68, MSE=4193, p<.001, ηp 2=.25, but other main and interaction effects were not significant, ps>.05. Polynomial contrasts carried out on Block revealed a linear trend, F(1, 62)=34,04, MSE=13715, p<.001, ηp 2=.35, but this effect did not interact with Group or Stimulation, ps>.05. This indicates that the RTs decreased linearly across training blocks, but irrespective of group or stimulation. In the group of patients, RTs in the sham condition amounted to M=961 ms (SD= 470,8) in random Block 7 and M=930 ms (SD= 447,8) in the averaged surrounding sequenced Blocks 6 and 8, thus resulting in a sequence learning effect of M=31 ms (SD=79,3). In the stimulation condition, RTs were M=938 ms (SD=411,6) in Block 7 and M=903 ms (SD=410,4) in Blocks 6 and 8, leading to a learning effect of M=35 ms (SD=86,3). In the group of controls, RTs amounted to M=691 ms (SD=202,3) in random Block 7 and M=641 ms (SD=217,5) in the averaged adjacent sequenced Blocks 6 and 8, hence, the learning effect was M=50 ms (SD=44,8). In the stimulation condition, the RTs were M=686 ms (SD=205,7) in Block 7 and M=640 ms (SD=224,9) in Block 6 and 8, which led to a learning effect of 46 ms (SD=57,3). The statistical analysis of sequence-specific learning effects confirmed the earlier established main effect of Group, F(1, 62)=10.29, MSE=448579, p<.01, ηp 2=.14. Sequence-specific learning also proved to be highly significant, as shown by the significant main effect of Sequence, F(1, 62)=29.36, MSE=3562, p<.001, ηp 2=.32. Post hoc Tukey test indicated that sequencespecific learning was significant in the group of patients, in both the sham and tDCS stimulation condition, p<.05 and p<.01, respectively. Also in the group of controls, sequence learning proved to be significant in both the sham and tDCS stimulation condition, ps<.001. However, contrary to our expectations, other main and interaction effects were not significant, all ps>.05. Thus, in neither group, the difference in sequence learning between sham and stimulation reached statistical significance, ps>.05. In 16 out of 31 PD patients (of which 2 lefthanded), the dominant side was most affected by the disease. To determine the impact of affected side on the results, we reran the SRT analyses of the patient group with the inclusion of the factor Most affected side (dominant, non-dominant hand). With respect to the analyses of the training blocks (general training effect), patients whose non-dominant hand was the most affected were slower (sham: M=1039 ms, SD=14,7 and stimulation: M=1043 ms, SD=54,0) than patients whose dominant hand was the most affected (sham: M=862 ms, SD=26,5 and stimulation: M=819 ms, SD=15,7), but the difference was not statistically significant, p>.05. With respect to the sequence-specific learning effect, we found no difference between the two groups of patients and no difference between the sham and stimulation condition within each group, ps>.05. Sequence-specific learning in patients whose non-dominant hand was the most affected amounted to M=33 ms (SD=95,5) in the sham condition and M=36 ms (SD=91,5) in the stimulation condition. Sequence-specific learning in patients whose dominant hand was the most affected amounted to M=29 ms (SD=59,2) in the sham condition and M=34 ms (SD=81,5) in the stimulation condition. The analyses of the SRT task did not yield any significant difference in sequence learning between the sham and stimulation condition, in either the patient or control group. To determine whether the observed null-effects were due to a lack of statistical power, we first carried out a post-hoc power analysis on the SRT data. The power analysis showed that for a statistical F-test, type repeated measures within–between interaction, with a=.05, n=64, 2 groups, and 4 repetitions (sham vs. tDCS stimulation; random vs. sequenced blocks), the power (1 – β) to detect a small (f=0.10), medium (f=0.25), and large effect (f=0.40) amounted to .44, .99, and .99. A general recommendation for adequate power in statistics is 1 - β=.80 . Subsequently, we calculated post-hoc Bayes factors for each group to assess whether a lack of difference in sequence learning between the sham and stimulation condition could be interpreted as evidence for the absence of an effect of tDCS stimulation on sequence learning.32 In the group of PD patients, the Bayes factor amounted to B=0.63 (meandiff=4.4, SE=13.60, uniform from 0 to 35). In the group of controls, the Bayes factor was B=0.21 (meandiff=-3.7, SE=10.44, uniform from 0 to 46). A Bayes factor of 3 is generally considered substantial evidence against the null hypothesis; 1/3 or less as evidence for the null hypothesis, whereas a Bayes factor between 1/3 and 3 is taken as an indication that more data is needed to distinguish between the null hypothesis and the alternative hypothesis . None of the clinical or demographical variables correlated significantly with the amount of sequence-specific learning in either group or stimulation condition, all ps >.05. In the current study, we determined whether anodal transcranial direct current stimulation (tDCS) of the primary motor cortex (M1) would promote motor sequence learning (also known as procedural learning) in PD patients. Our results show significant motor sequence learning in PD patients as established in the Serial Reaction Time (SRT) task. In contrast to previous studies that observed impaired sequence learning in PD, the current sample showed intact sequence learning relative to controls [5-10]. This corroborates findings of a recent meta-analysis that sequence learning impairments are not consistently observed in PD patients . To date, it remains to be determined which variables such as disease severity and cognitive status may explain the inconclusiveness of the literature on sequence learning in PD . In the current study, none of the patient variables we included proved to be related to sequence learning performance in PD patients, so the current results do not clarify this issue. More importantly, in both patients and controls, sequence learning was unaffected by anodal tDCS delivered over the primary motor cortex. 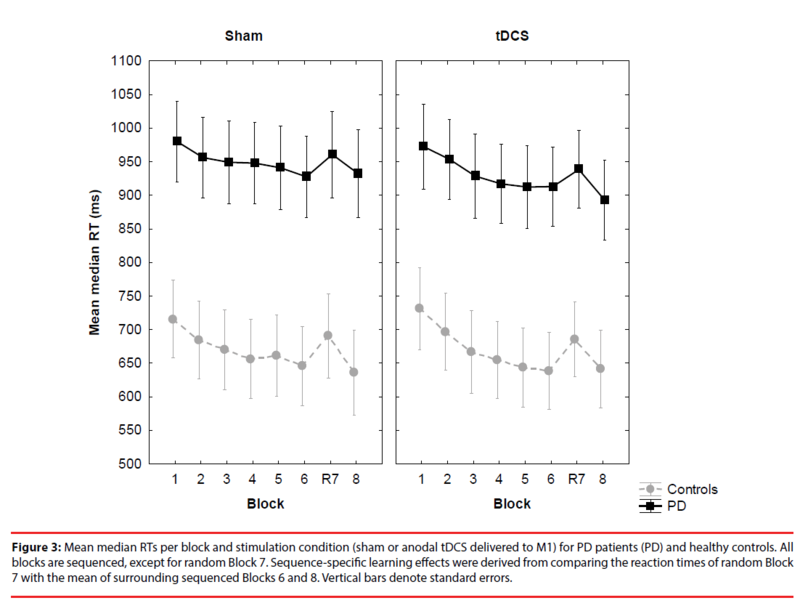 PD patients did not show enhanced sequence learning while receiving anodal tDCS as compared to sham stimulation, and neither did the group of matched healthy controls. This was unexpected, as three previous studies reported positive effects of anodal tDCS on sequence learning in the SRT task in young healthy individuals (one following cerebellar stimulation  the other two following stimulation of M1) [25,26]. We therefore further analyzed the results using post-hoc power and Bayesian analyses. The power analysis indicated that our study had very high power to detect moderate to large effects, but insufficient power to detect small effects. To be able to detect a small effect (with 1 – β=.80), however, we should have included a sample of n=138, which is not a realistic option for this type of clinical research. In comparison to previous tDCS studies on sequence learning (in healthy young samples [24-26] or in PD ), the sample tested in the current study was substantially larger. It should be noted, however, that despite adequate statistical power to detect moderate to large effects, the results of the Bayesian analysis were inconclusive in the group of patients as to whether we can accept the null hypothesis. This suggests that more research is needed before we can truly rule out a positive effect of tDCS stimulation on sequence learning in PD. In contrast, in the group of controls, the Bayes factor indicated that we found substantial evidence for a lack of an effect of tDCS on sequence learning under the present testing conditions. In what follows, we will discuss our results based on their statistical non-significance. But the reader should keep in mind that more research in PD patients is needed in order to rule out a positive effect of anodal tDCS stimulation of M1 on sequential skill in PD. The current findings reveal that sequence learning did not differ between sham and anodal tDCS stimulation delivered over the primary motor cortex. One could argue that sequencespecific learning did not improve upon anodal tDCS stimulation because of a ceiling effect, due to normal limits to neuroplasticity . In the current study, each participant had to carry out the SRT task four times (twice under tDCS and twice under sham stimulation), but each with a reduced number of trials. This was done to allow for the proper development of motor sequence learning, while at the same time counteracting fatigue effects in PD patients. However, the total number of training trials was entirely comparably to other tDCS studies on motor sequence learning and the observed sequence learning effects were also in the same line than what is to be expected in older adults and PD patients. A ceiling effect is thus highly unlikely to explain the absence of a positive tDCS effect. At this stage of research, we are unable to determine why anodal tDCS delivered over the primary motor cortex had no significant effect on motor sequence learning, unlike studies using a healthy young sample [24-26]. One previous study in PD patients similarly failed to observe a positive effect of anodal tDCS on motor sequence learning in PD patients . But in the current study, also matched controls failed to benefit from the application of tDCS. This might suggest that only young participants can benefit from positive effects of tDCS on motor sequence learning. An explanation in terms of age differences, however, does not seem very likely, given that positive effects of tDCS have been reported in older individuals, such as patients with PD [16-22]. A more plausible explanation is that methodological differences can account for the positive effect of tDCS as observed in young adults, compared to a lack of an effect in older adults and PD patients. When we compare the experimental SRT set-up across all tDCS studies that have been published on sequence learning [19,24-26] a number of methodological differences become apparent, such as the amount of training, the number of random blocks, the structural characteristics of the sequences employed, the way of responding (e.g. index finger in the current study as compared to four fingers in previous studies). Similarly, and more important, also tDCS parameters differ substantially between these studies, complicating direct comparison even more. For instance, in all previous sequence learning studies, the electrode size was substantially larger than in the current study. Hence, stimulation in these studies may have extended well beyond M1, hereby inducing a positive effect of tDCS. In addition, a number of studies, including the current one, applied a stimulation current of 1mA , whereas others have delivered tDCS current of 2Ma [19,24,26]. All these methodological variations make it difficult to pronounce upon the exact variables that may account for the differential findings that are reported in tDCS studies on sequence learning. An exact replication in PD patients of a tDCS study that has previously established a positive effect on sequence learning in healthy young controls might shed light on this issue. It should also be noted that the neurological mechanism underlying tDCS itself needs further clarification. How does tDCS precisely act on neurotransmitter release, such as dopamine, and how might it modify the activity of brain networks, such as the cortico-basal gangliathalamocortical networks? In the present study, all patients were tested on medication, in line with a previous study . However, several studies have shown that medication status selectively modulates sequence learning, both at the behavioral and the neural level [19,33,34]. Accordingly, future research including testing of patients both on and off medication is needed to establish possible interactions of stimulation and medication. Future studies should also address which brain area elicits the largest tDCS response in PD. In line with previous studies (except for one that applied cerebellar stimulation ), the present study delivered tDCS stimulation over the primary motor cortex M1. The established null-effects are thus specific to this area. Other brain areas (e.g., SMA, pre-SMA, DLPFC) are known to contribute to motor sequence learning, however, and should therefore be targeted in future studies to further investigate the influence of tDCS on sequence learning in PD [11-12]. To conclude, in the current study, we found no effect of anodal tDCS stimulation delivered over the primary motor cortex on the acquisition of sequential movement in PD and matched controls. Positive effects on motor [16-20] and cognitive [21,22] function have been observed in PD, however, and thus tDCS application seems promising for clinical practice. Especially given these promising preliminary results, we believe it is mandatory to also inform the scientific and clinical community when null-effects are observed, like is the case it the present study. The fact that positive effects of tDCS are not systematically observed highlights the need for more systematic research on the determinants of tDCS in PD, such as medication status, the amount of tDCS stimulation needed, as well as the brain regions that need to be targeted to elicit a positive response. This work was supported by the Research Council of the Vrije Universiteit Brussel [grants OZR1904BOF and BASS33]. We thank Evelyne Bahire, Krista Beck, Margaux De Bruyn, Bo Hellinckx, Sarah Massart, Sofie Ryckaert, Yolien Schellemans, Kathy Teugels, Nikolaus Twickel, Chloë Vandommele and Wout Vereecken for their valuable assistance in collecting the data. Natacha Deroost: conception and organization of research project, design and execution of statistical analysis, writing of first draft. Kris Baetens: design and execution of statistical analysis, review and critique of first draft. Jochen Vandenbossche: conception and organization of research project, review and critique of statistical analysis, review and critique of first draft. Eric Kerckhofs: conception and organization of research project, review and critique of statistical analysis, review and critique of first draft. Jankovic J. Parkinson’s disease: clinical features and diagnosis. J. Neurol. Neurosurg. Psychiatry 79(4), 368-376 (2008). Pagonabarraga J, Kulisevsky J. Cognitive impairment and dementia in Parkinson's disease. Neurobiol. Dis 46(1), 590-596 (2012). Middleton FA, Strick PL. Basal ganglia and cerebellar loops: motor and cognitive circuits. Brain. Res. Brain. Res. Rev 31(2-3), 236-250 (2000). Cleeremans A, Destrebecqz A, Boyer M. Implicit learning: news from the front. Trends. Cogn. Sci 2(10), 406-416 (1998). Deroost N, Kerckhofs E, Coene M, et al. Learning sequence movements in a homogenous sample of patients with Parkinson's disease. Neuropsychologia 44(10), 1653-1662 (2006). Vandenbossche J, Deroost N, Soetens E, et al. Does implicit learning in non-demented Parkinson’s disease depend on the level of cognitive functioning? Brain. Cogn 69(1), 194-199 (2009). Siegert RJ, Taylor KD, Weatherall M, et al. Is implicit sequence learning impaired in parkinson’s disease? A meta-analysis. Neuropsychology 20(4), 490-495 (2006). Clark GM, Lum JAG, Ullman MT. A meta-analysis and meta-regression of serial reaction time task performance in Parkinson’s disease. Neuropsychology 28(6), 945-958 (2014). Ruitenberg MF, Duthoo W, Santens P, et al. Sequential movement skill in Parkinson's disease: a state-of-the-art. Cortex 65(1), 102-112 (2015). Wilkinson L, Khan Z, Jahanshahi M. The role of the basal ganglia and its cortical connections in sequence learning: evidence from implicit and explicit sequence learning in Parkinson's disease. Neuropsychologia 47(12), 2564-2573 (2009). Penhune VB, Steele CJ. Parallel contributions of cerebellar, striatal and M1 mechanisms to motor sequence learning. Behav. Brain. Res 226(2), 579-591 (2012). Doyon J, Bellec P, Amsel R, et al. Contributions of the basal ganglia and functionally related brain structures to motor learning. Behav. Brain. Res 199(1), 61-67 (2009). Wu T, Hallett M. A functional MRI study of automatic movements in patients with Parkinson’s disease. Brain 128(10), 2250-2259 (2005). Kamsma YPT, Brouwer WH, Lakke JPW. Training of compensational strategies for impaired gross motor skills in Parkinson’s disease. Physiotherapy: Theory and Practice 11(1), 209-229 (1995). Kuo MF, Unger M, Liebetanz D, et al. Limited impact of homeostatic plasticity on motor learning in humans. Neuropsychologia 46(8), 2122-2128 (2008). Broeder S, Nackaerts E, Heremans E, et al. Transcranial direct current stimulation in Parkinson's disease: Neurophysiological mechanisms and behavioral effects. Neurosci. Biobehav. Rev 57(1), 105-117 (2015). Kaski D, Dominguez RO, Allum JH, et al. Combining physical training with transcranial direct current stimulation to improve gait in Parkinson's disease: a pilot randomized controlled study. Clin. Rehabil 28(11), 1115-1124 (2014). Fregni F, Boggio PS, Santos MC, et al. Noninvasive cortical stimulation with transcranial direct current stimulation in Parkinson’s disease. Mov. Disord 21(10), 1693-1702 (2006). Benninger DH, Lomarev M, Lopez G, et al. Transcranial direct current stimulation for the treatment of Parkinson's disease. J. Neurol. Neurosurg. Psychiatry 81(10), 1105-1111 (2010). Valentino F, Cosentino G, Brighina F, et al. Transcranial direct current stimulation for treatment of freezing of gait: a cross-over study. Mov. Disord 29(8), 1064-1069 (2014). Boggio PS, Ferrucci R, Rigonatti SP, et al. Effects of transcranial direct current stimulation on working memory in patients with Parkinson’s disease. J. Neurol. Sci 249(1), 31-38 (2006). Doruk D, Gray Z, Bravo GL, et al. Effects of tDCS on executive function in Parkinson's disease. Neurosci. Lett 582(1), 27-31 (2014). Nissen MJ, Bullemer P. Attentional requirements of learning: Evidence from performance measures. Cognitive. Psychol 19(1), 1-32 (1987). Ferrucci R, Brunoni AR, Parazzini M, et al. Modulating human procedural learning by cerebellar transcranial direct current stimulation. Cerebellum 12(4), 485-492 (2013). Nitsche MA, Schauenburg A, Lang N, et al. Facilitation of implicit motor learning by weak transcranial direct current stimulation of the primary motor cortex in the human. J. Cogn. Neurosci 15(4), 619-626 (2003). Kang EK, Paik NJ. Effect of a tDCS electrode montage on implicit motor sequence learning in healthy subjects. Exp. Transl. Stroke Med 3(1), 4 (2011). Folstein MF, Folstein SE, McHugh PR. Mini-mental state. A practical method for grading the cognitive state of patients for the clinician. J. Psychiatr. Res 12(3), 189-198 (1975). Marinus J, Visser M, Verwey NA, et al. Assessment of cognition in Parkinson’s disease. Neurology 61(9), 1222-1228 (2003). Fahn S, Elton RL, Committee UD. The unified Parkinson’s disease rating scale. In: Fahn S, Marsden CD, Calne DB. Eds. Recent developments in Parkinson’s disease, 293-304 (1987). Murphy KR, Brett B, Wolach A. Statistical Power Analysis: A Simple and General Model for Traditional and Modern Hypothesis Tests. 4th ed. NY: Routledge; 22 (2014). Dienes Z. Using Bayes to get the most out of non-significant results. Front. Psychol 5(1), 781 (2014). Kwak Y, Müller ML, Bohnen NI, et al. Effect of dopaminergic medications on the time course of explicit motor sequence learning in Parkinson's disease. J. Neurophysiol 103(2), 942-949 (2010). Kwak Y, Müller ML, Bohnen NI, et al. l-DOPA changes ventral striatum recruitment during motor sequence learning in Parkinson's disease. Behav. Brain. Res 230(1), 116-124 (2012).